Hi, my name is Hilary Jordan and I am married with three young children, and I am a cake creator! I live in Co. Wexford, Ireland. I started to dabble in cake making when my son was born and as he has got older his demands for more adventurous birthday cakes has inspired me to experiment with design. And having two daughters now, I have entered the world of pink sparkly cakes! I have come a long way since my first attempt at a birthday cake and now there is nothing I won't have a go at. A lot of my family, friends and neighbours have asked me to make cakes for their special occasions, birthdays, weddings, christenings etc. and through word of mouth I am now in steady demand. I believe in quality and fresh ingredients. After all what is the point in a cake looking beautiful if you can't eat it. All cakes are individually priced helping me to design a cake to suit everyone's pocket. Each cake is based on a standard price for a basic cake and then decoration added, i.e. the more detailed the cake the more money you pay. If you have seen one of my cakes, or see your ideal cake in a magazine, or have your own individual design idea in mind you can e-mail or telephone me and I will be happy to give you a price. My prices are very competitive. All cakes can either be collected or delivery can be arranged. With such a lot to organise for your big day, it can be easy to overlook your wedding cake. 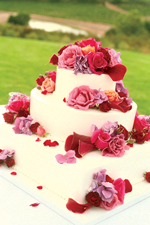 Your cake is not only a symbol of your marriage, but provides a focal point at your reception. So please consider all your options and take everything into consideration, colour etc., when designing it. All wedding cakes can be tailor made to compliment your day. Any designs you have seen may be adapted for your needs. Cupcakes also available, to order - contact me for details. Owners Caroline & Sandra are delighted to assist with any queries, quotes or ideas you may have! Call us on 074 97 32823. Over 20 years of experience in the art of cake production and a real pride in each commission. "i need a hand made gluten free wedding cake in wexford i need a gluten free specailty cake in wexford i need a bespoke handmade cake in ireland"